8 Blocks in 15 Days! 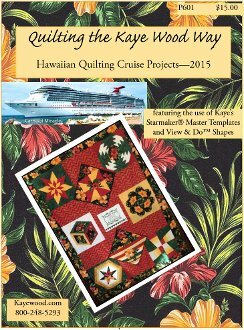 Join Kaye vicariously as she quilted her way to Hawaii and back. Read the stories and create your own version of this epic quilt! Kaye used all of the Starmakers and All of the View & Do Shapes to create this beautiful quilt. Finishing techniques as well. Finished quilt is 44" x 60"